I am so pleased to be sending out the first "President's Pen" as the newly selected president of IASWG. I want to introduce myself to you as I commence the first year of my three-year term. I have a deep commitment to social group work and have been a proud member of IASWG since attending the Quebec City Symposium in 1997. I served as chapter chair of the Toronto chapter of IASWG from 2001-2010, was elected as a member-at-large of the IASWG board from 2010-2014 and acted as co-chair of the IASWG practice committee from 2014-2018. My work experience includes many years as a social work practitioner, primarily in the area of pediatric mental health and health, as well as in social work education (Assistant Professor, Status only, Factor-Inwentash Faculty of Social Work, University of Toronto, Canada), research and administration (recently retired Director of Social Work at the Hospital for Sick Children in Toronto, Canada). I hope that this broad experience will allow me to ensure the voices of group work practitioners, administrators, academics, and researchers will be heard across IASWG. The November IASWG board meeting was an exciting event, with our three new members-at-large, Poppy Masinga (South Africa), Linda Ducca (Spain) and Roseprimevere Jacques (United States) joining the board. Our two co-Vice Presidents, Ginette Berteau (Canada) and Reineth Prinsloo (South Africa) and I were thrilled to welcome them to our growing and internationally diverse board. We were also pleased to welcome our newest chapter to IASWG, the Alberta chapter, with Matthew Miller as chapter chair, representing the 20th chapter of IASWG. The past six months have been busy ones for the organization. We had the privilege of experiencing a symposium in Kruger National Park, in South Africa in June. The Lithuanian chapter of IASWG held a group work camp in October. The Toronto chapter co-hosted a mini-groupwork camp with the Ontario association of Social Workers in November. The Massachusetts chapter held a November event, When It Gets Real: Navigating Challenging Moments in Groups. The IASWG symposium planning committee is actively at work, designing an exciting June event. Please mark the date: June 5-8, 2019. 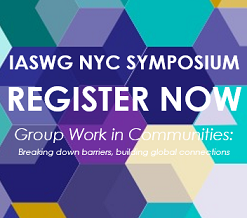 The theme of this year's symposium is: Group work in communities: Breaking down barriers - building global connections. We look forward to receiving your submissions for oral and poster presentations. As we look ahead to the holiday season, we would like to remind you that now more than ever, it is the time for group work. As our IASWG statement reads: "We need to find ways to become inclusive, to celebrate our differences and to generate a powerful sense of togetherness... Social groupwork can create security where there is uncertainty, a feeling of belonging where there is alienation, and a vehicle for positive, communal action where there is a sense of helplessness." Please join us in this mission through joining or renewing your IASWG membership! We hope to see you in June. But in the meantime, we wish you a happy, healthy holiday season and a Happy New Year.